Governor Parson signs Executive Order creating a Missouri School Safety Task Force. 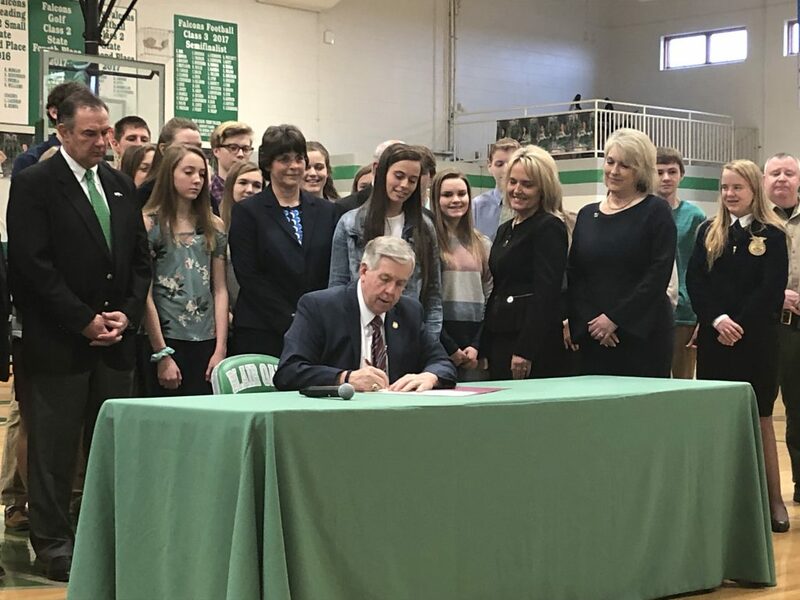 Governor Mike Parson signed an Executive Order on March 13 at Blair Oaks High School directing a task force to develop a statewide strategic plan for school safety. MSBA’s Center for Education Safety will play a key role in the creation of the plan. Governor Parson said the purpose of the task force will be to make Missouri specific recommendations for schools and school districts. “A statewide study of school safety is needed to evaluate best practices in Missouri and to identify potential areas of improvement,” he said. He said the strategic plan will identify resources currently available through MSBA’s Center for Education Safety and other organizations for schools and districts to use to better ensure their preparedness. The task force is to issue its report by July 31. The strategic plan would be made available to every school and school district before the start of the 2019-20 school year. The group will be led by Lt. Governor Mike Kehoe. Other members include the Director of the Department of Public Safety, Sandy Karsten; the Director of the Department of Mental Health, Mark Stringer; and Commissioner of Education, Dr. Margie Vandeven. Governor Mike Parson signs an Executive Order directing the development of a statewide strategic plan for school safety.